Everyone knows the old adage about losing the majority of your body heat through your head. Your mother always said to wear a hat when you went outdoors. Well, it appears she might have been right after all. It stands to reason that this phenomenon is magnified as divers don't dive in water that is body temperature. So, the moment you put your head in the water, you start to lose vital body heat. There is nothing more distracting than being cold while diving. 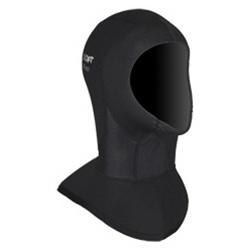 You can simply eliminate this problem by purchasing the hood that matches your diving activities. If you are a warm water diver, then the 2mm Warm Water Hood is perfect for you. Not only does it keep you warm, it protects your head from those floating stinging critters. It is very lightweight, in addition, very comfortable to the point where it is easy to forget you have it on. For colder water, more protection is needed. That is where the Storm 6/3 hood can come into play. Divers who need the maximum warmth can use the Seasoft Ti Pro, the Drysuit hood with a zipper for easy donning. Whatever your need and wherever you go, a hood from Dolphin Scuba Center will cover all your bases and keep your mother happy, too!.